Boy do I love decorating nurseries. Babies and all of their tiny adorable things. I love to search through pinterest to find all of the new theme ideas with 100 interpretations for each. After we finished transitioning our little girlies into their new girly room, it was time to get started on our preparations for little man. We knew our Bemidji babe needed a proper North Woods theme so I went the direction of woodland animals. As usual, I did my best to reuse and repurpose where ever I could. 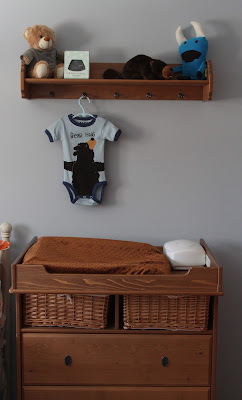 His changing table and this shelf were originally purchased at IKEA for Curly Girl's nursery. 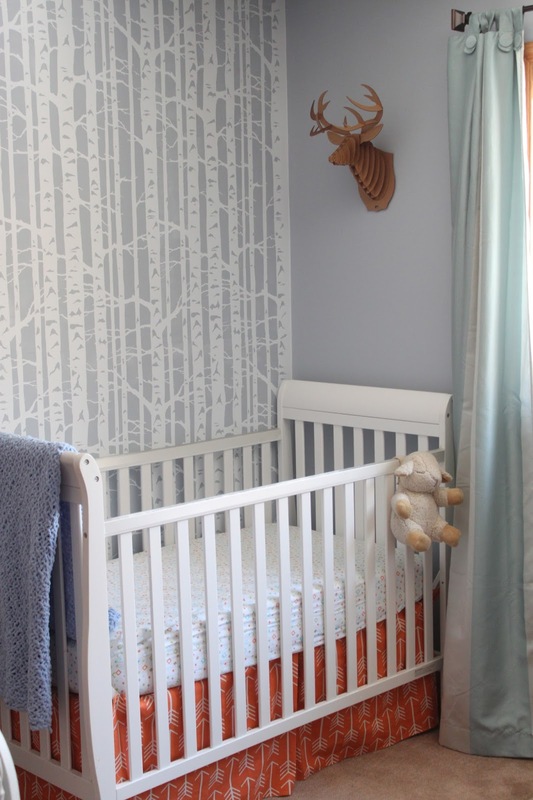 I loved the idea of displaying some of his adorable woodland animal clothing on the hooks. 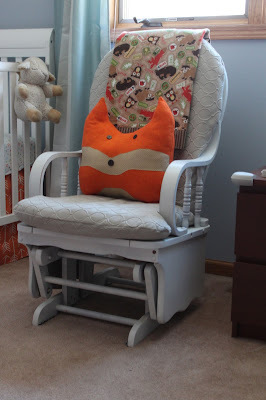 I refinished this sad $10 craigslist find for GiGi's nursery. A fresh coat of white spray paint and a little grey fabric splurge turned this into a cozy little feature. I found a scrap of orange flannel at a local fabric store and turned it into a simple and fun fox pillow. 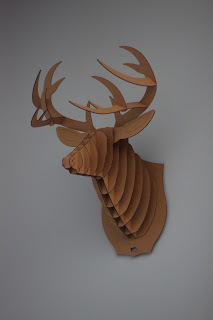 Two of my favorite things in the room are this awesome birch tree feature wall and the cardboard deer head I bought at a local gift shop. I also loved the trendy pop of orange with this great arrow print fabric from Premier Prints. We squeezed in a day bed with some more pops of orange. How cute is this little squirrel night light? It's too small put off any real light but was just perfect for middle of the night diaper changes. 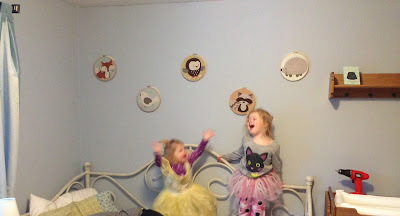 My mother found cut outs from a quilt from a discontinued Carter baby line at a thrift store so we framed the fabric circles in embroidery hoops as a perfect way to feature some woodland animals without having a nursery of matchy-matchy baby items. The girlies clearly had a great time helping me hang them while they jumped on the daybed in their PJs and tutus. 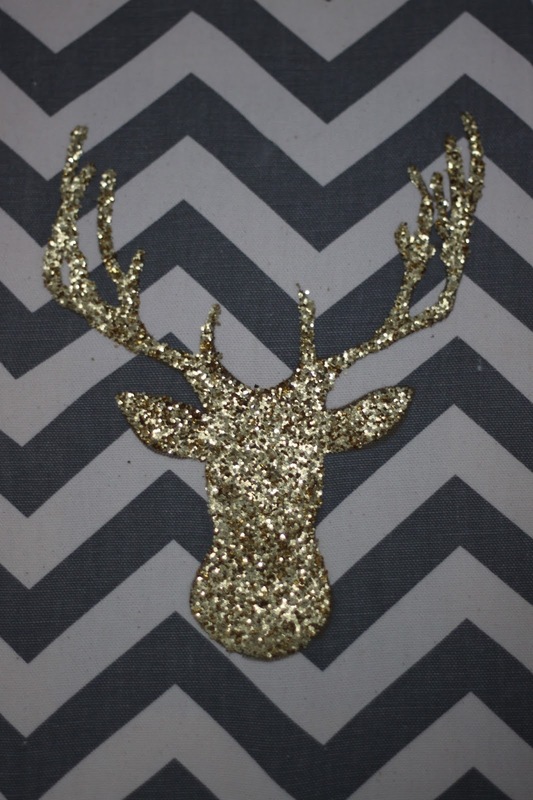 Sparkly glitter animal silhouettes in my boy's room? Yes. 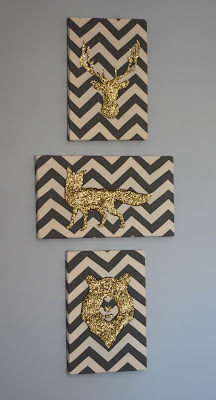 I reused some decor from our previous home's kitchen with the frames and chevron fabric. I had hot glued some brightly spray painted kitchen tools onto the fabric. I ripped those off and painted some fabric glue on that I covered in gold glitter. Another fun way to feature some DIY woodland animal art. My favorite--the deer antler silhouette. 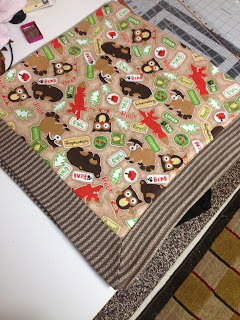 Of course I had to make my favorite mitered corner blanket with some fun woodland animal fabric and a super soft striped flannel. The before pictures--sad, poorly painted purple. The music notes. I celebrated painting over these… though I appreciate the previous owner's creativity. I found this AWESOME stencil from Cutting Edge Stencils. No doubt this baby is going to be used again. What a fabulous design and big enough that I only had to do eight sections to cover the wall. One afternoon to finish this beauty! …and an Instagram filter makes it even more dramatic. There it is! My favorite room to date.